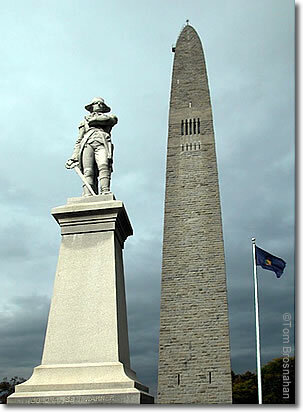 The impressive obelisk commemorates an important American victory in the Revolutionary War. The Battle of Bennington was not actually fought here, but in neighboring New York state. The monument stands on the site of the colonists' arsenal which was the object of the British advance. At more than 306 feet (93 meters), the Bennington Battle Monument in Old Bennington VT is the tallest structure in Vermont. It took four years (1887-91) to build the monument, and when it was finished one could walk to the top by means of an interior staircase. Today the staircase is closed and an elevator hums up and down. Buy your ticket in the souvenir shop to the west of the monument entrance, and pick up a copy of the free leaflet describing the battle and the monument. The view from the monument is very fine. Though you wouldn't recognize it, you can look west to where the battle actually took place, less than 6 miles away. For a closer view, follow "Bennington Battlefield" signs from the monument through a covered bridge to North Bennington, then west on Route 67 to the Bennington Battlefield Historic Site near Walloomsac NY. Plaques describe the battle, and shaded picnic tables provide a good place for a rest and a snack. His supplies depleted by the action at Fort Ticonderoga, "Gentleman Johnny" Burgoyne sent two of his units toward Bennington to capture the Revolutionaries' arms stores. But General Burgoyne misjudged the size of the rebel force, and was unaware that General John Stark, who had fought at Bunker Hill and under Washingtonat Trenton and Princeton, commanded the Americans. Stark cleverly headed off the British advance at Walloomsac (New York), 6 miles west of the arsenal. Stark is said to have exclaimed, "There are the Redcoats! They will be ours tonight or Molly Stark sleeps a widow." The pitched battle on August 16, 1777, lasted 2 hours, and when the smoke cleared, the American forces were victorious. On the way back to Bennington, Stark's troops were surprised by British reinforcements, but Colonel Seth Warner and his Green Mountain Boys arrived in time to save the day for the Americans. The losses at Bennington and lack of supplies weakened the British force, and Burgoyne surrendered his entire command in October following the Battle of Saratoga.